Winter is an exciting time of year! We talk about all the fun holidays, yummy desserts, and of course the snow! Whether you live where it snows or not we can’t help but find entertaining activities that have something to do with SNOW!! Students love learning to add up numbers… especially when we can make it interesting. So we find things around the classroom, playground, and at home that can be turned into addition problems. I’m always on the lookout for ways to connect what our students are learning to things that matter to them, like with games they play, adding up their friends in class, and even adding up all of our thumbprints on our Snowman Art. With hands-on math, they will then retain and understand what they are being taught. 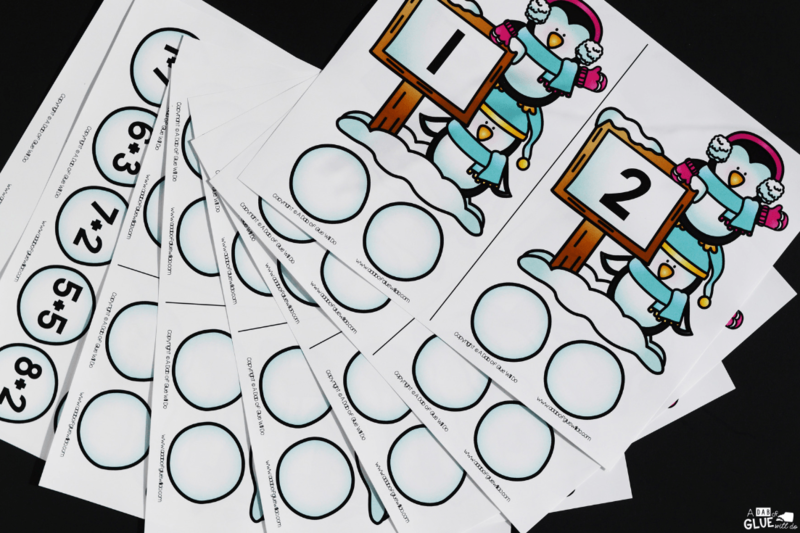 Our students learn and review their numbers with this Snowman Number Match game, and they show us their mastery of phonetics with our Snowman Middle Sound Match-Up. Since the snow theme gets our children learning without realizing they’re learning, I’ve created these Snowball Addition Mats. These mats are a great way to help our preschool and kindergarten students learn and review their addition facts in an enjoyable way that’s perfect for winter. Connect this snowball math activity to science with our Snow Science Unit! each page covers two different numbers. 2 pages of snowball addition sentences, with 2 sentences per number. I recommend printing this center on cardstock and laminate it so you can use the center for years to come. These snowball mats are so easy and engaging to use in math centers. Students will start their math game by picking a number mat to work on. They will then search through the snowballs looking for an addition sentence that matches the sum on their mat. You may want to have students work in groups the first time they play this Snowball Addition Mats activity. Another way this activity could be used is to have all of the number mats laid out on a table or the floor. Students will then sort the remaining addition sentences according to their number. 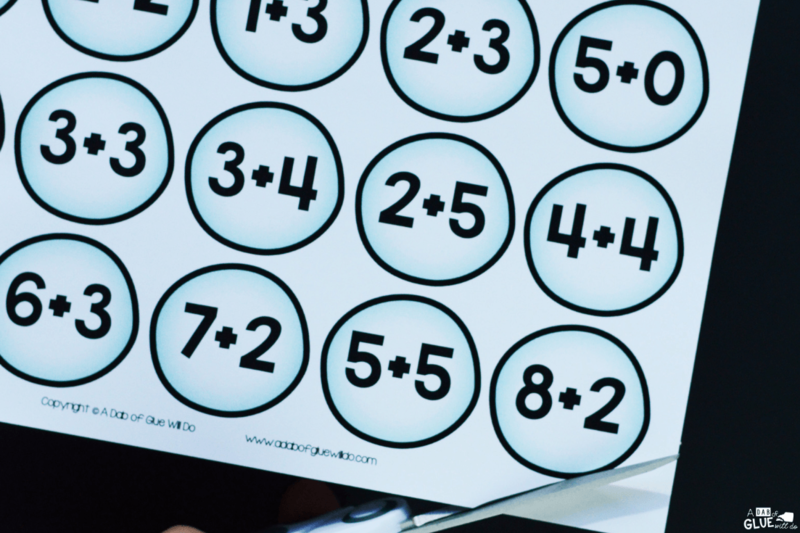 If you have younger students or students struggling with this concept that might be overwhelmed with all the pieces at once, you can differentiate this activity and provide them with only two numbers at a time. Once they master the pieces you gave them, you can slowly add in more. To simplify things a little more, you can give them only one addition sentence snowball they are looking for at a time. As they grow more confident, you can give them both addition problems at once. To challenge your students, you can ask them to come up with other addition problems that could also be added to each number. So for the child who has chosen 6, have them figure out different addition sentences that aren’t already included on the snowballs with this printable, such as 4+2, 6+0. They can create more snowballs with additional addition sentences that also equal the sum on the mats or write the equations on a piece of paper. When students have figured out the addition sentence, they will use a vis-a-vie marker to write it out on their penguin mat. This is an excellent way for your students to also practice writing their numbers. Since these markers erase so easily, they can keep practicing until they get it correct. I place all of the mats in one of my math tubs with a few vis-a-vie markers and a Ziploc baggie with slightly wet sponges (so students can clean their mats when it is time to clean up). 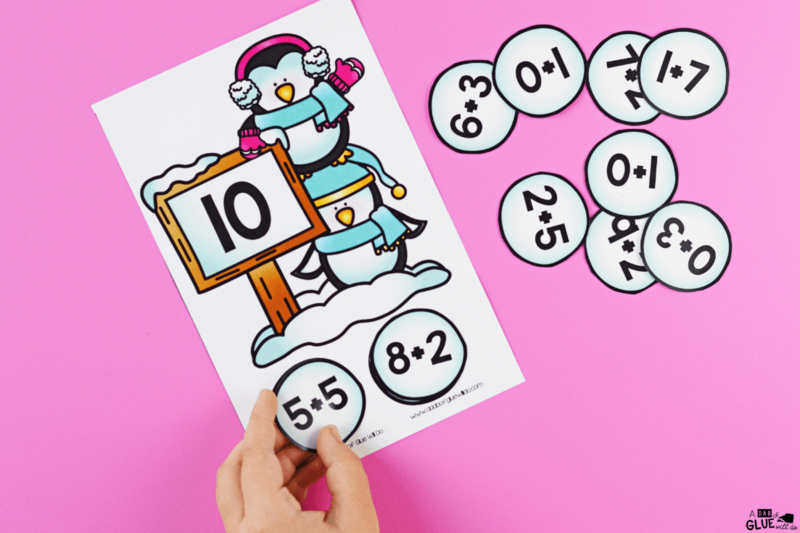 Are you looking for a way to be able to customize your students’ learning of addition and subtraction facts with a winter theme? 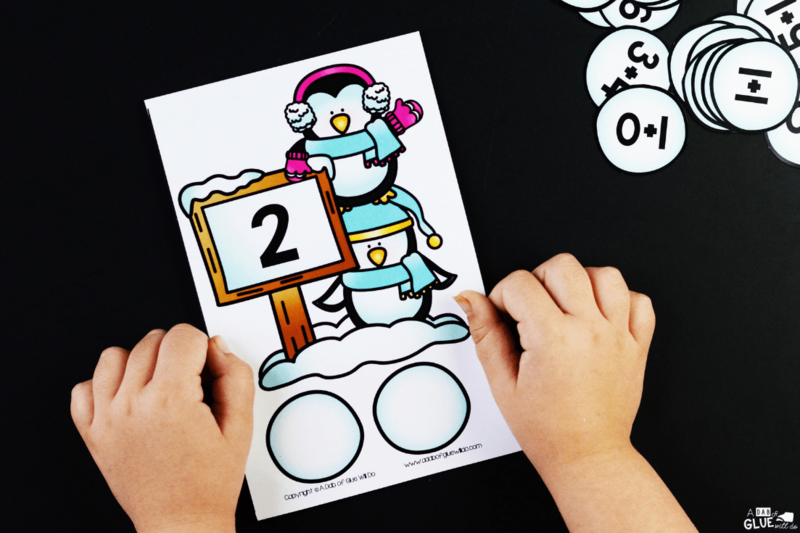 Take a look at my Snowman Editable Addition and Subtraction Activity. Want More Winter Activity Ideas? 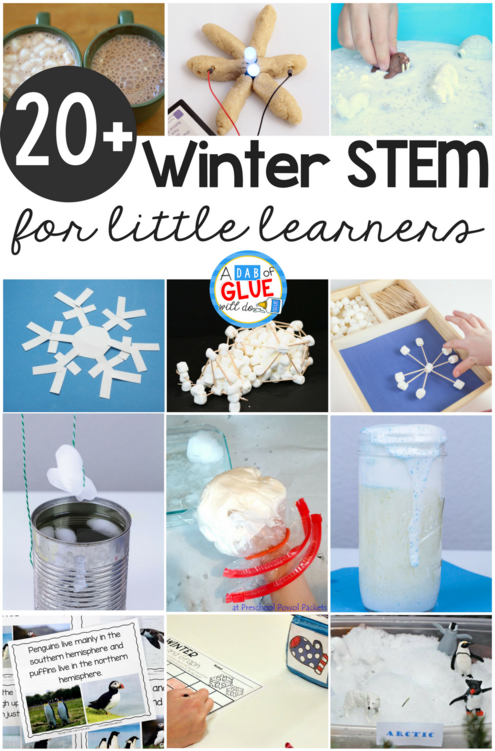 If you want to extend the winter theme across your curriculum, check out our STEM Winter Activities!! 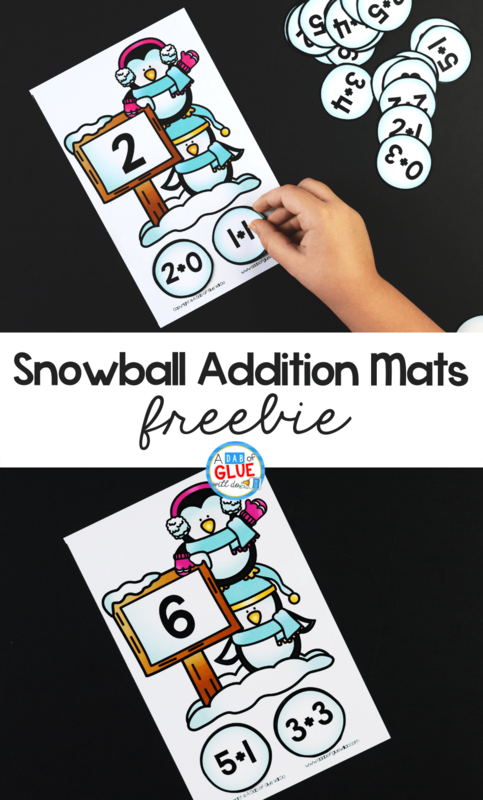 Download Your Snowball Addition Mats Printable Below! Have fun adding and talking about the snow with our Snowball Addition Mats activity in your classroom! Oh Jennifer – yet another amazing game from you – thank you so much!! Hi Glenda, I’m so glad you enjoy it! Thank you for letting me know! Great center item! Thanks for all your hard work! Hi Linda! Thank you so much, I’m so happy you enjoy them!